Filmmaker Jesse Davidge said he was inspired to make a documentary about the A.J. Goddard shipwreck because of a nagging feeling he always had growing up — that "there wasn't anything left to discover in the world." 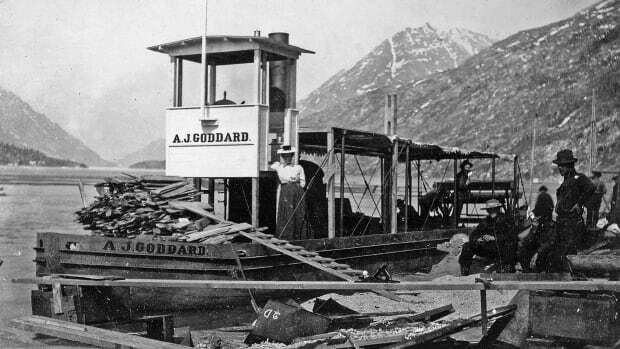 The story of the Gold Rush-era steamboat, found at the bottom of Lake Laberge in 2008, showed him that wasn't true. "People who weren't in the professional world, but still were able to help discover this boat really inspired me to want to tell the story to younger people," he said. The ship went down during a winter storm in 1901 but its exact location was unknown until some divers, including Davidge's uncle, Doug Davidge of the Yukon Transportation Museum, "stumbled on it". "That started the whole process of researching the vessel, and also surveying the vessel on the bottom of Lake Laberge," Doug Davidge said. "People from all across North America became interested in it as this little time capsule of artifacts and a way of life, actually." The wreck, still at the bottom of Lake Laberge, has been designated a Yukon historic site. Divers regularly visit it, with the requisite government permit. The new film explores the Gold Rush history of the vessel, as well as its discovery by Doug Davidge and others.